The Oust MOC 5 Tech Bearing was designed for endurance in technical skateboarding. Some of the roughest conditions in skateboarding are reached during the ollie's, blunts, grinds, and tricks of technical skating. To maximize the strength of the MOC 5 Tech bearing a high strength carbon steel ball cage was used. This cage would ensure ball placement in the harshest environments and extend bearing life for thousands of skating hours. The MOC 5 Tech bearing is manufactured with the same high precision specification as the MOC 7 Speed. 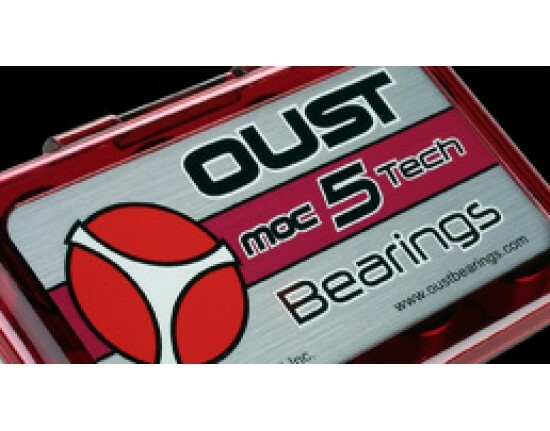 All OUST Bearings come lubricated from the factory with MET-OL Synthetic speed oil. All MOC Series bearings should be lubricated every 6 hours of use with MET-OL Synthetic speed oil. When skating slalom, down hill racing or distance racing the bearings should be lubed every 2 hours of racing. If no MET-OL is purchased along with the bearings, the proper lubrication maintenance schedule with MET-OL is not followed, and/or other lubricants are used, the OUST bearing warranty will automatically be VOID. Also if the bearings aren't purchased directly through Oust bearings then no refunds will be given. This matter must be taken up with the company where the original transaction was made. All bearings are sold packaged 8 bearings per pack.